Decorate your bathroom with sparkle and shine with the help of Cricut and Adhesive Foil. 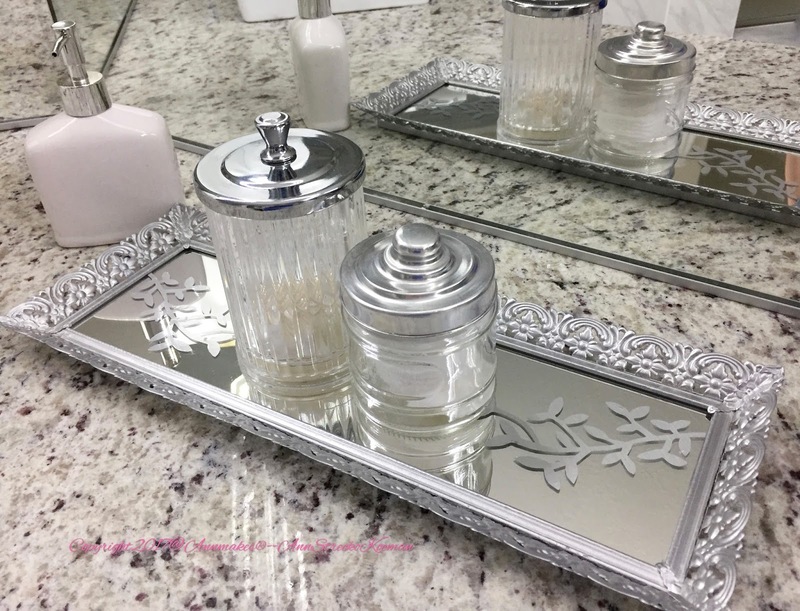 As a Blogger/Brand Ambassador for Cricut, I am pleased to present my post this month where I show how I take an old small framed gaudy looking mirror and alter it into a cute piece of home decor for our newly renovated bathroom. Having invested a lot of money into the renovation project, I wanted to find low-cost ways to add unique touches to our master bath. 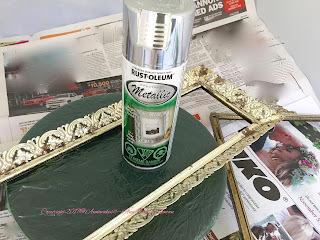 I had this old discolored and scratched up metal framed mirror just wasting shelf space in our garage. Instead of tossing it I decided to try and give it a second chance. Step one: Find a framed mirror, mine happens to be an old cosmetic holder. Step Two: Clean the grime off. Make any repairs needed. Step Three: Prepare the frame for its transformation. In my case, I took the frame and mirror apart. Step Four: Spray Paint the frame with a metallic spray paint from Rust-Oleum Testors. Let Dry. 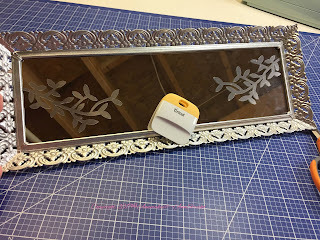 Step Five: With the Cricut Explore Air 2 make some foil decals to alter and update the look of the mirror. Use the Purple mat, and Cricut Foil. Follow instructions in the Cricut Design Space. I used a "Vine" image available as a Free copy in the library. In the Design Space, I duplicated the vine and chose to make a Mirror image of the second vine. Step Six: Remove Foil Decals from Purple mat with Transfer film. Apply stickers to clean mirror. Re-assemble mirror and frame. If you are asking: "How easy will it be for "ME" to use the Cricut software?" I am here to let you know that it is so easy! All you need to have is internet access, a smartphone, tablet, or computer! Oh, of course, a Cricut! Any model that has blue tooth or the internet access. I use the Cricut Explore Air 2, and The Cricut Design Space. 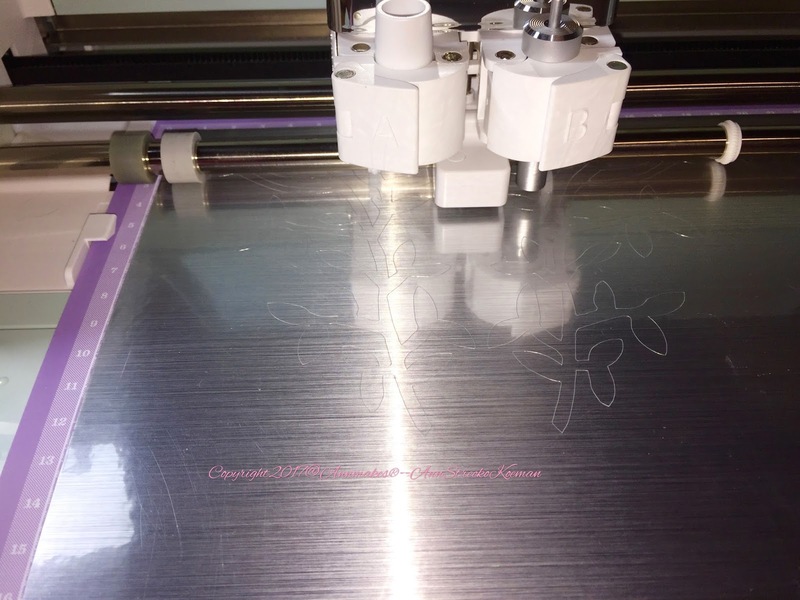 Cricut Design Space works with the Explore line of machines. There are over 60 000 fonts, images, and more. Available by purchasing individually, through a subscription, and even many are free. 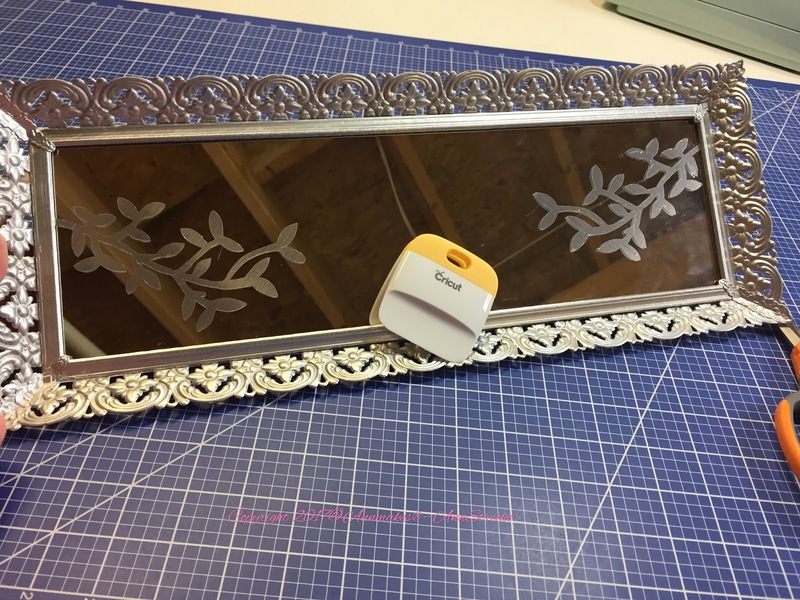 Cricut Design Space has clear and easy to understand video tutorials for you to learn, at your own pace, how to work with all the possibilities the software has to offer. "Cricut Design Space makes it easy to go from inspiration to creation." Don't have an Explore? No, problem. 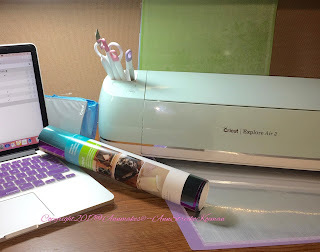 Connect with the Cricut Craft Room. "The Design Tool with image library." Also, has easy to follow video tutorials. Provides access to your own saved images from cartridges and other sources, free available images and fonts, and pay as you go too! Free download of Cricut Craft Room available here: https://home.cricut.com/cricut-craft-room for non-Explore Cricut.